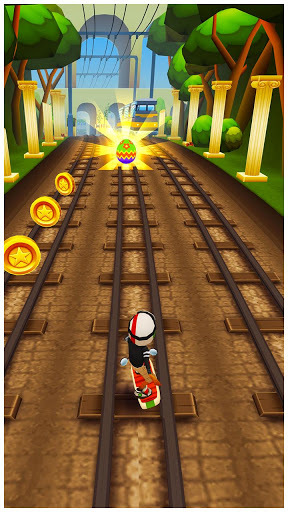 One of the sleeper hits on the charts over the last year has been a tiny game out of Denmark called Subway Surfers. It’s a runner game like Imangi’s Temple Run that has a character named Jake riding train tracks and dodging trains. That single title has helped Kiloo and Sybo, the studio it co-produced the game with, reach 26.5 million daily active users. For comparison, that’s more daily users than Zynga had on mobile platforms last quarter. Subway Surfers was also the sixth most actively used game on U.S. iPhones in December, according to app tracking company Onavo. It has some off-the-charts retention numbers with 91 percent of players returning after day 1 and 60 percent returning after 30 days. How did they do it? Kiloo’s chief creative officer Simon Moller credits a co-production model where they split development of the game with outside studios. Kiloo handles the free-to-play part with the user interface, monetization, marketing, user retention and community. Their developer partners focus on the concept and art. Moller, who co-owns the 50-person company with his brother, says Kiloo’s model isn’t about publishing. He insists it’s different. What’s happened over the last year on mobile platforms is that early companies like Pocket Gems and then big publicly-traded companies like Zynga have started a publishing arms race. With their reach, they promise indie studios distribution and customers. While indie hits do break out from time to time, the market overall is just getting a lot more expensive and competitive. Last month, Distimo said that only 2 percent of the top 250 publishers in the iPhone App Store were “newcomers,” versus just 3 percent in the Android store, Google Play. Publishing is also a way for the bigger gaming companies to de-risk their portfolio and counter the hits-driven nature of the business by relying on outside studios for original IP. The publishing model, which was necessary in a world where games were packaged goods sold on store shelves for $60 or more, is controversial on mobile platforms where anyone can just submit an app to the store. There is always a question who really created the value? Was it the game developer with the original concept and art, or the publisher made certain tweaks or suggestions to make a game more appealing to a mass audience? Even to this day, the original Angry Birds game published with the Chillingo label still has some lingering bad blood. The thing is that hits can be so unpredictable that it’s hard to say looking backward who was truly responsible for making a game successful and what a fair revenue split should be. In Kiloo’s co-production model, the company splits revenues 50-50 with partners. It goes back to the Mollers’ childhood where everything between the two brothers was split evenly. He said the company probably spent at least 20 thousand hours on building the game and then another roughly $20,000 on marketing it (which is a lot lower than the few million dollars per month many of the top studios spend on marketing these days). “We spent all our money on product because we believe that product can win by itself,” he said.